Here’s what’s up in the world of TV for Wednesday, February 18. All times are Eastern. 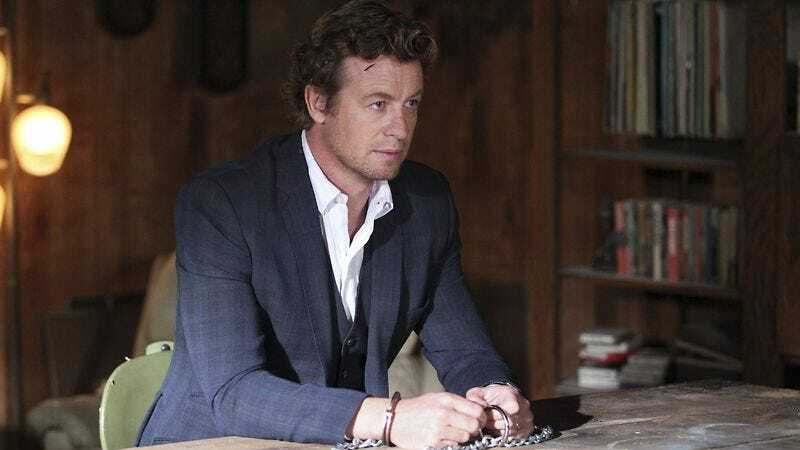 The Mentalist (CBS, 8 p.m.): The Mentalist isn’t just on tonight—it’s having a two-episode series finale event. Yes, series finale. That might feel like it’s come out of nowhere (just like an RKO), but here it is. In episode one, “Jane goes back to his roots and pretends to be a psychic in order to lure out a serial killer for the FBI.” Then, in the second and final episode of the series, “Lisbon agrees to marry Jane.” If you’ve only watched the pilot episode of The Mentalist, then both of these plot points probably make absolutely no sense to you. In fact, if you’re like your friendly, neighborhood What’s On Tonight contributor who watched the first six and a half (out of seven) seasons, it still makes no sense. But now is not the time for sense; now is the time for goodbye. So goodbye, The Mentalist. P.S. In all seriousness: Other than being about individuals with keen observational and deductive skills (like pretty much any lead in a procedural series), The Mentalist and Psych had nothing in common. The Middle (ABC, 8 p.m.) / The Goldbergs (ABC, 8:30 p.m.): Is Sue going to say yes to Darrin’s marriage proposal? Since this isn’t Suburgatory (sorry—too soon), probably not. (At least, hopefully not. She’s still in high school.) Then again, as the voiceover goes, they do things differently in the area known as “The Middle.” As for The Goldbergs, “Adam doesn’t take kindly to being voted ‘nicest guy’ in the school yearbook.” Will Harris thinks we should probably synchronize our watches and start the countdown to the “bad boy” makeover montage. Empire (Fox, 9 p.m.): It looks like the TV Guide Guy is just as invested in Empire as the rest of us: “Lucious tries to brand Empire Entertainment as a tight-knit, family-run business which, ironically, complicates the already tense relationship between Hakeem and Jamal.” Joshua Alston agrees that’s all the recipe for a perfectly fascinating episode of television, but like us, he’s a little disappointed the episode description isn’t just this. Broad City (Comedy Central, 10:30 p.m.): This week, in “The Matrix,” Abbi and Ilana decide to go off the grid and leave their electronics behind for the day. Last week, Broad City gave us all the gift that keeps on giving: Val. How is the show going to live up to such beauty? We don’t know, but we (especially Caroline Framke) are excited to find out. Joshua Alston has a TV Review giving an in-depth look at Black-ish’s status as a sitcom 13 episodes in. Book Of Negroes (BET, 8 p.m.): The last two parts of the six part, Canadian/BET mini-series air tonight. “Racial tensions are enflamed in Nova Scotia as Aminata organizes a final return journey to Africa.” No need for a joke. Nova Scotia does all the work. American Idol (Fox, 8 p.m.): Does American Idol even really exist anymore? Be honest. Sources say that this week’s “episode” is “Showcase #1,” which sounds about as real as the rest of the episodes this season. The Mysteries Of Laura (NBC, 8 p.m.): We’ll give it to you this week, Laura: “The Mystery Of The Alluring Au Pair” is a pretty catchy title. Law & Order: Special Victims Unit (NBC, 9 p.m.): In the hilariously titled 16th-season episode “Undercover Mother,” a mother takes a perfectly logical approach to find her missing daughter: She works as a madam. As for the rest of the episode: “Benson gets some life-changing news.” If it’s not as life-changing as the mother becoming a madam to find her missing daughter, then it’s not big enough for this episode. Sorry, Olivia. Nashville (ABC, 10 p.m.): This week on Nashville, Rayna James is absolutely furious when she finds out that Jeff plans to sign her daughter Maddie to his record label. Just imagine how furious she’ll be when she finds out Jeff was able to get her ex-husband to sign off on it because he blackmailed him over his love of a prostitute. That will totally make the series’ focus on Maddie worth it. Stalker (CBS, 10 p.m.): What time is it? Oh, it’s time for Stalker Mad Libs, gentle readers. In “Fun And Games,” “Beth’s [adjective] stalker goes on a [adjective] and [adjective] rampage targeting her [noun] as he [adverb] moves in on her.” Sounds interesting, right? Also, according to The Futon Critic, this is the “1st season winter finale.” Pretty interesting, sis. Schitt’s Creek (POP, 10 p.m.): In “Don’t Worry, It’s His Sister,” Johnny— You know what? This show is hilarious. Just watch it. Watch What Happens: Live (Bravo, 11 p.m.): Hey! Remember Hugh Grant? Suits (USA, 10 p.m.): Not only is this episode the directorial debut of series star Patrick J. Adams, it’s an episode in which Louis “fights to get the respect a name partner deserves.” Sure, the latter is something that happens every episode of Suits (at least the respect thing is), but the former must be pretty exciting. Hopefully Patrick J. Adams’ direction will give the suits the focus they’ve always deserved. They’re where the show gets its title, after all. Maid In Manhattan (Oxygen, 8 p.m.): It’s like the old question goes: If you found yourself in the loft (from the movie The Loft), what Jennifer Lopez movie would you and your chosen male Loft star companion watch? If your answer is Maid In Manhattan, then boy are you in luck tonight! The Apartment (TCM, 8 p.m.): Speaking of The Loft, it’s not on television. But Billy Wilder’s The Apartment is, and that’s basically the better version of the whole secret-affair-flat premise. Sure, The Apartment doesn’t randomly have Eric Stronestreet in it, but if Eric Stonestreet’s your only criteria for Wednesday night television, you already have an alternative in Modern Family. Lucha Underground (El Rey, 8 p.m.): If you’re a wrestling fan that hasn’t been watching Lucha Underground, you’ve been missing out on the best singles run of Chavo Guerrero’s career. Luckily, you can rectify that by finally starting Lucha Underground. Tonight, Chavo takes on The Man Of A Thousand Deaths, Mil Muertes. He’s going against a guy whose origin story involves watching his family die and then taking comfort in being on the brink of death himself. That’s cool. WWE NXT (WWE Network, 8 p.m.): Did you watch NXT TakeOver: Rival last week like we told you to? No? Well do that first so you’re caught up come the new episode. You’re welcome. Kroll Show: “This week, Kroll Show goes up against The Illuminati and the lizard people.” That’s how Kayla Kumari Upadhyaya starts her review of this week’s episode of Kroll Show. Off you go.